The 16th General Assembly of ICOMOS took place in Québec City from September 28 to October 4, 2008, a triennial event attended by members of ICOMOS National Committees throughout the world. The Philippines was represented by Augusto Villalón, President of ICOMOS National Committee Philippines and Expert Member of the International Scientific Committee for Vernacular Architecture (CIAV). The second delegation member was Ivan Anthony Henares who was the Philippine representative to the International Forum of Young Researchers and Professionals in Cultural Heritage, an Expert Member of the International Cultural Tourism Committee (ICTC), and a voting delegate to the General Assembly. Villalon represented ICOMOS Philippines at the Advisory Committee Meeting on September 28 that was attended by all National Committee Presidents. Issues discussed were the strengthening of National Committees and revitalization of dormant ones, formation of new National Committees. Also the relationship of ICOMOS to the World Heritage Committee as its primary cultural heritage advisory body was discussed. At the September 29 Annual Meeting of the International Scientific Committee on Vernacular Architecture (CIAV) Augusto Villalón was elected Vice-President. CIAV members thanked the Philippine Committee for organizing the 2007 Annual CIAV Meeting in Banaue, Ifugao Province, and further pledged their support for conservation activities in the rice terraces undertaken by both the Government of Ifugao and Save the Terraces Movement (SITMo). During the General Assembly held on September 30, Villalón was elected Chairman of the Candidature Committee charged with verifying documentation for each candidate standing for election to office during the 2008-2011 triennium. Resolutions were read and passed during the General assembly, notably Resolution No. 14 proposed by Ivan Anthony Henares (Philippines), and Cliff Ogleby (Australia) on the institutionalization of youth participation is all future ICOMOS activities. During the Forum on October 2-3, Villalón presented a well-received paper “Is Spirit of Place Enough?” which was a case study and status report on the Rice Terraces of the Philippine Cordilleras, currently on the World Heritage In Danger List. The Québec City Declaration on the Preservation of the Spirit of Place was adopted by the Assembly on 04 October. 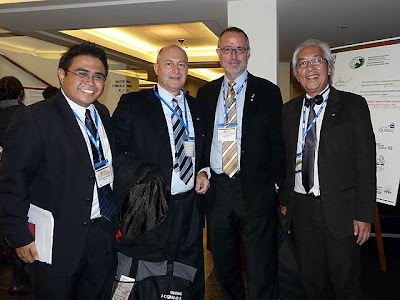 The 16th General Assembly of ICOMOS, meeting in Quebec, Canada, in October 2008, resolves that . - The national committees will take the necessary proactive measures to welcome and involve a greater number of young researchers and professionals, and assure them a sufficient representation.